Every time I read an urban fantasy, I remind myself that I am not the primary audience. After all, much of what I dislike about urban fantasy are the very things I dislike about bad books. Stereotypical characterization, repetitive narratives, and repetitive tropes (if I see one more tramp stamp cover I'm going to blow a gasket). But Rhiannon Held's Silver bucked the trend, taking what should have been yet another stupid werewolf novel and turning it into a rigorously constructed sociological foray into a potential werewolf culture. discover through him as he battles against the memories. Working to uncover those responsible for Silver's torture, Dare must confront the demons that make him anti-social and unwilling to lead. One might say that I'm an unusual reader when it comes to urban fantasy. All those flashy monsters and the like really don't mean much to me if they are substitutes for character development. What is powerful about urban fantasy for me isn't so much that it is the fantastic littered in contemporary spaces; rather, it is that urban fantasy seems like a perfect space for examining the relationships between characters, human and otherwise. Silver is such a novel, with a tangential focus on plot. What centers the novel, and made it work for me as a fantasy, are its characters. Dare is sympathetic and mysterious; reading about his development as a character, moving from a man afraid of responsibility to a man who must take it, was refreshing, in part because it meant the story needn't reduce itself to a long series of random werewolf fights in order to explore a set of themes (in this case: haunted pasts, torture, pack culture, etc.). Likewise, Silver, the second POV (less focused in this novel for reasons that become obvious as you read), suffers from similar traumas. Though her development is less pronounced than Dare's -- it is partly her past that Dare is trying to uncover -- Silver's growth as a character offers a emotional exploration into psychosis and werewolf phenomena. Readers expecting an action-packed novel would do best to explore elsewhere; this is not that kind of story. Perhaps the novel's greatest strength lies in Held's attempt to take a fantastical concept -- the existence of werewolves -- and put a soft science spin on it. Much of the novel draws attention to the dynamics of werewolf packs and the power struggles that exist within them. While the idea is likely not original, it is one that Held handles well. Rather that infodump, the pack dynamics play a central role in the plot, allowing the reader to see the interrelations between packs, the ways in which individuals maintain pack dominance (including Dare's struggles with his own alpha nature), and so on. One might look at Silver and call it anthopological urban fantasy. That would be a fair assessment considering that Held has argued in interviews that the world of Silver is more science fiction than it is fantasy; the werewolves have an implied evolutionary origin in the novel, which will play a more important role in future novels. Whether her universe can be conceived as a science fiction one is up to speculation; regardless, the rigor with which Held constructs her werewolf culture means the story never takes its fantastic elements for granted. That's something I can appreciate as a reader. The werewolves don't exist just for the sake of existing, as is sometimes the case in urban fantasy. They exist because there's a seemingly logical reason for it. I sometime call this "building a world that feels lived in." Silver brings us that world: a lived-in-world in the present, with a definable, if not mysterious, history. My largest criticism of Held has to do with what she does not adequately cover. One of the subplots is the expected development of a relationship between Dare and Silver. While Dare struggles against his instincts, feeling that even a sexual flirtation with Silver is a violation of his ethical code, he eventually gives in, and it is implied that they will remain mates (in werewolf terms) for future novels. What troubles me about this is what it says about the characters, and what is not said about how others view their relationship. In other words, their relationship is, to put it bluntly, troublesome for precisely the reasons Dare cites: Silver is disabled and still psychologically unable to cope with what has happened to her, even though we see her move away from that weakness towards the end of the novel. In a very real sense, her ability to consent should be questioned, puzzled out, and explored in more depth. While Held does attempt to explore this social dynamic, Dare seems to give in too easily to temptation, and not enough resistance, in my mind, is provided by the secondary cast. Perhaps this stems from Dare's alpha nature. If so, I hope future novels will delve into the problems of their coupling. Overall, though, this is a solid first novel. Even if what Held does is not wholly original, her ability to craft a werewolf mythology that is more anthropoligical than paranormal is commendable -- and certainly appreciated by this reader. 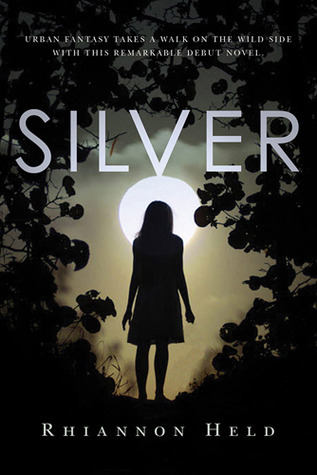 Silver is the kind of novel that shows an author's strengths. Held handles the character drama with focus and molds a fantastical present worth exploring further. She has a lot of potential as a writer, and I sincerely hope Silver does well enough to warrant future books, whether in this series or otherwise. If you want to learn more about Silver, you can check out the publisher's website or Rhiannon Held's page. The book is available just about everywhere books are sold.